2013 marks the fortieth anniversary of the Supreme Court's abortion decision in Roe v. Wade, one of the most divisive rulings ever to shape American politics. In recent years, attempts to overturn Roe v. Wade have reached a fevered pitch. Since 2010, hundreds of bills banning or putting up roadblocks to abortion access, contraception, and basic women's health have been proposed across the United States, with nearly one hundred new laws going into effect. The goal is to create a law that will eventually be brought before the Supreme Court in order to overturn Roe v. Wade. 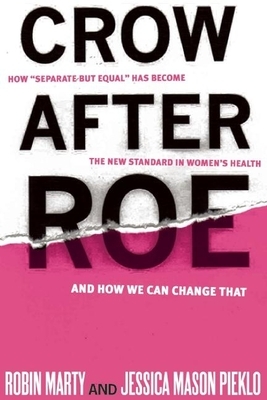 Crow After Roe: How "Separate But Equal" Has Become the New Standard In Women's Health And How We Can Change That examines eleven states--Arizona, Idaho, Indiana, Kansas, Mississippi, Nebraska, Ohio, Oklahoma, Wisconsin, Texas, Utah and Washington DC--that since 2010 have each passed a different anti-abortion or anti-women's health law explicitly written to provoke a repeal of Roe v. Wade. The chilling effect of these laws has been to establish a reproductive health care system in these states that makes abortion legal in name only, and which places women--especially poor, rural, or those of color--into a separate health care class, with few choices or control. Featuring a foreword by Gloria Feldt.